In the Live window, the lower part of the screen shows the actions. If you click on one of the red actions, a new menu with actions will show. Click on "Variety" or press "B". A new set of actions will appear. There are plenty of empty keys here, so we will use this menu to do some experiments. Right click on the "Z" button. A list will popup where you can select what kind of action you want to assign to this key. A window will popup where you can select a function. Find the group with the heading "-----Tempo----" and click on "Tempo Up". A description of this function will be shown in the lower part of the window. The label "Tempo Up" is now visible on the Z button. 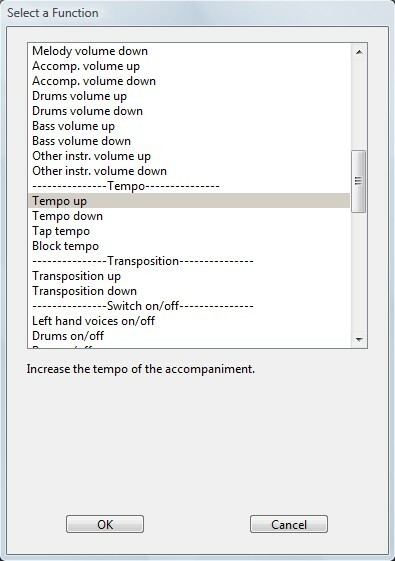 Click on it or press the "Z", you will see that the value of the tempo in the upper left part of the window, increases. Now right click on the "X" button and select "Assign to voice". Select "Violin" and click on OK. The label "Violin" is now visible on the "X" button. Click on it or press the "X" button, the voice in the upper left part of the window will now show "Violin". Right click on the "C" button and select "Assign to preset". 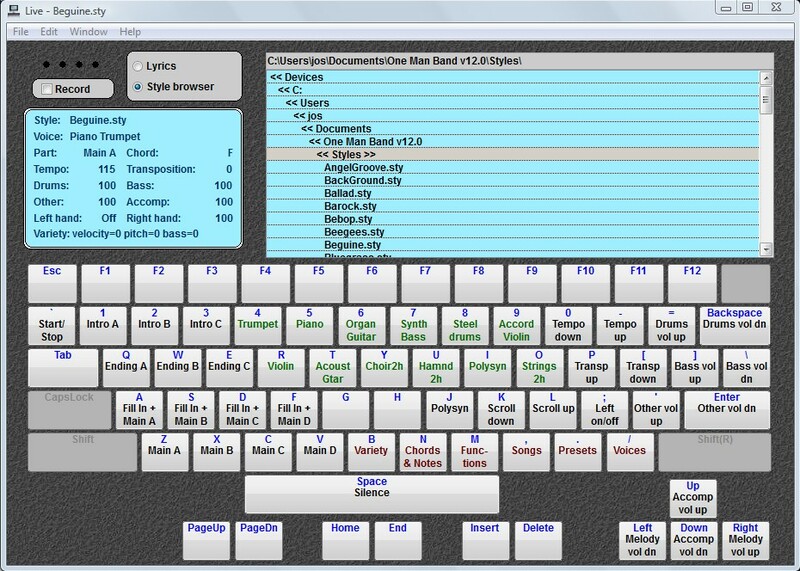 The window shows the current style, multivoice and tempo. These will be activated when you select this preset in the future. Other properties are blurred out, they will stay unchanged when you activate the preset. You can enable these properties by clicking on the checkmark. Keep in mind that any property that is activated in a preset, will stay the same when you choose a preset where this property is not enabled. To set things back to normal in other presets, you can enable the changed property in all other settings too. A more convenient method would be to make a "generic-reset" preset that sets everything back to normal. You can add an "X" at the end of a preset that changes special properties. That would be a warning "Cleanup after use", use the "generic-reset" preset before activating the new preset. Type "Test Preset" in the label and press OK. The label "Test Prest" is now visible in the "C" button. Click on a style in the upper right part of the window. See how the name of the style in the upper left window is changed. Now click on the "C" button. Notice that the name of the style is changed back to what it was when you defined the preset. Remember if you want to edit this preset in the future, you must first left click to activate it before you right click it. Otherwise it is assumed that you want to assign the current properties to the preset. Right click on the "V" button and select "Assign to menu". Type "Test Menu" in the label. 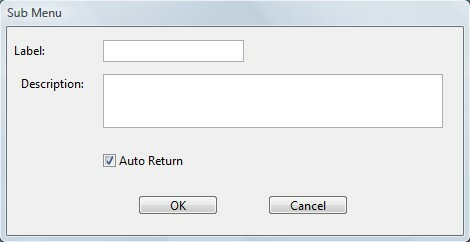 Uncheck the Auto Return option or you will return to the main menu each time you choose a action in this menu. You will now have an empty menu on screen, with only the Escape key defined for "Exit menu". Right click on the "1" button, select "Assign to Function", click on "Start/stop" (under ---Variations---) and click on OK. Right click on the "2" button, select "Assign to Chord", don't change anything, just click on OK. 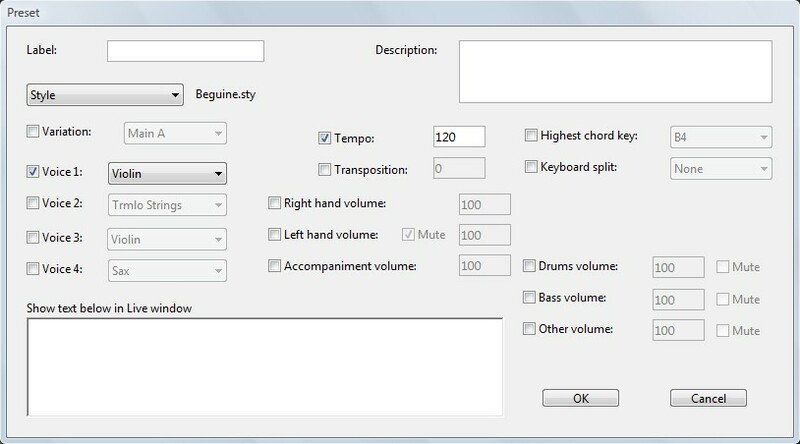 Right click on the "3" button, select "Assign to MIDI message". Type "Test message". 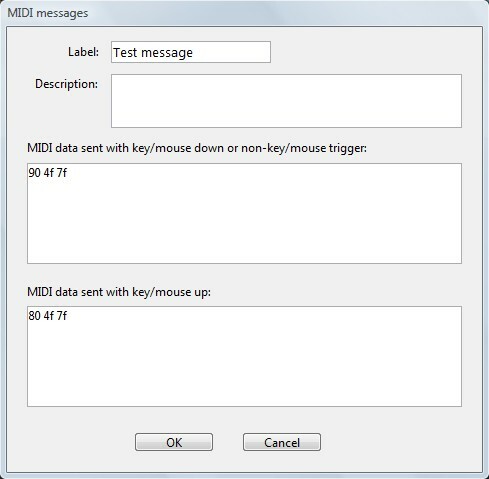 Now when you click on button "3" a Note-On MIDI message is sent on channel 1 and a Note-Off message when you release the mouse. 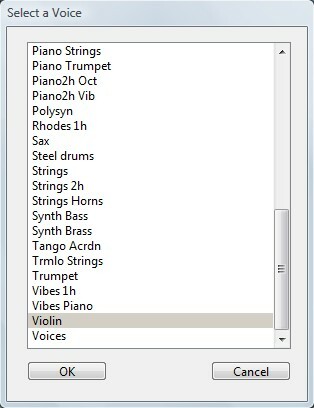 You can combine any number of MIDI messages in one long string. A system exclusive message "f0 7e 7f 09 01 f7" meaning GM reset or GM on. A program change "C0 00" selecting a piano on channel 1. A controller message "b0 07 7f" setting the volume on channel 1 to maximum. To find out more about available MIDI message, check the manual of your synthesizer. Right click on the Test menu at the "V" button and select "Cut Action". Now right click on the "B" button and select "Paste Action". The Test Menu is now at the "B" button. Now use the Cut Action to remove the actions you added to buttons in this tutorial..